Ampac Forwarding specializes in packing your product for safe transit. All packaging methods meet or exceed the specifications of national freight carrier and ocean freight carrier standards. Whether you have one item to ship, need High Point Market Services this April or October, want to Outsource in High Point for year-round US Distribution, GO, Global OnDemand with a full-service US office, or need export wrap, consolidation, and global logistics with One Stop capabilities, Ampac is a furnishings expert and your dependable packing and shipping resource.
" We have been using AMPAC for quite a few years now and have been very pleased with the results. 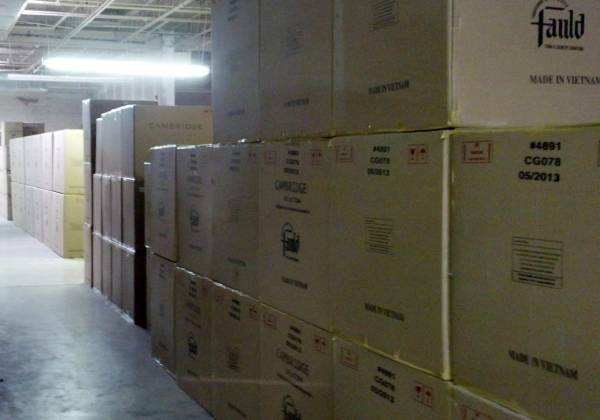 They are a full service warehouse that has been helping us to store and ship our products with great success. They have intelligent staff that have been in the shipping/warehousing business for a long time and have saved us money in numerous ways with their expertise. They price out shipping quotes and handle our freight orders and catalogue distribution, all in a timely and cost effective way. I strongly recommend them to anyone looking for a full service warehousing option in NC." One item or many, furniture or not, a one-time packaging job or ongoing distribution, Ampac Furniture welcomes the opportunity to serve in other industries and our community! ...and like the creation of a nationwide distribution network with our best-of-the-best partners fo rapid and reliable in-home delivery--the latest and greatest trend for retailers and Ecommerce companies. The keynote of Ampac Forwarding's warehouses is flexibility. We know our Customers have critical, unique selling positions in the industry we have served for 25 years. Our customers have depended on us to manage our facilities cost effectively, while offering diverse space usage which is characteristic of wholesale and international commerce.
" We are an importer of upholstered furniture, and we use Ampac's services to pack showroom samples that we have on hand to ship to key customers for review. Time is the most crucial aspect of this process, and Ampac is always very prompt with their service. Their quick service, however, is never at the expense of quality. Ampac does an exceptional job packing all of our samples, and we have never had a piece damaged. I would highly recommend their domestic packing services to anyone with similar needs. " Foremost, our Customers who Outsource in High Point for year-round US and regional distribution require organized, inventory-sensitive storage empowering fast and accurate order fulfillment. We coordinate inventory management methods that are essentially manual as well as those that are barcoded and utilize electronic data transfer methods and tracking. We offer vertical, racked storage for small to medium accessory, lighting and other product lines, and we offer low-stacked floor storage for fine furniture, and other larger products that are best handled by hand, without the use of industrial equipment. 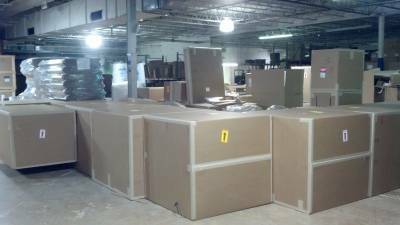 We maintain staging areas for fine furniture requiring skilled inspection, detailing, and packing in the order fulfillment process. We manage lines requiring light assembly, and the oversight of COM and custom finishing processes. We manage returns, and offer a variety of alternative responses such as repair and re-ship, replacement and disposal, and clearance sales to off-the-grid dealers. We maintain special repair areas so highly skilled artisans may perform repairs onsite. Staff and managers are assigned as "Customer Specialists", trained by our Customers to become hands-on and knowledgeable about their product line. Our GO, Global OnDemand program incorporates US office services: a customer service and sales support call center, administrative task fulfillment, as well as global logistics. These Ampac staff members have office space in our warehouse facilities. We offer partnership space for Customers who prefer to self-manage their space and inventory, but may require additional labor from time to time, or who may outsource only packing and shipping. We manage the storage and rapid fulfillment of "Quick Ship", "Just in Time", or "On Demand" inventory projects that require a unique flow and rapid order fulfillment. We reserve a staging area for time-sensitive cross-dock project management. Our flex-space concept allows for short and long-term storage of bulk goods where inventory management is not desired. We offer office space for Customers who are part of our Outsource in High Point program, and who want proximity to their inventory.
" I have worked with Ampac Forwarding for 2 years. They are always helpful and will offer suggestions for better shipping options. Both the office staff and warehouse staff are courteous and always where I need them, and on time. " Our One Stop international consolidation Customers are assigned individual bays adjacent to the staging area where final, accurate documentation can be checked in advance of the delivery of a ocean freight container to be loaded. Our High Point Market Services, and sooner or later, all of our Customers utilize our own unique production floor where custom packing for all shipping methods sets us apart. Over 100,000 square feet of fully insured flex space.